These are scarce notes. 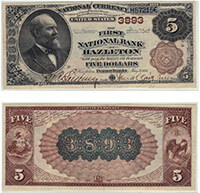 It is rare for a bank to have more than one or two survivors for this low denomination. The reason for the low rate of survival is that very few were printed. Two dollar bills have often been considered unlucky in past generations. So if you had one then you spent it quickly. Collectors call these "lazy deuces". Don't forget to check the serial number. Number 1 notes always sell for nice premiums.